“Ginataan” (Tagalog) and “tinunuan” (Cebuano) are synonymous words that mean “cooked in coconut milk”. To extract the milky liquid from a mature coconut, it needs to be grated first using a traditional grater “kudkuran” or a commercial electric coconut grater available in most wet markets in Philippines. Water is mixed with the grated coconut meat. The amount varies depending on the thickness of the coconut milk desired. One has to use both hands to work on the mixture and squeeze the milk out. The liquid passes through a strainer and into a container for measurement or directly into the pot on the stove. But with the convenience of canned coconut milk nowadays, I rarely use this method anymore. In fact since I moved to the US, I only use the canned ones, though I agree nothing beats the fresh coconut milk from scratch. As most Filipinos, I enjoy any coconut dish. The aroma and taste remind me so much of the tropics, of rich foods and warm climate, and memories of family and relatives in Philippines. Some of my favorite coconut dishes are chicken curry, maja blanca, biko, and coconut macaroons. The addition of coconut milk is very common in Filipino cuisine as coconuts are inexpensive and grow abundantly in Philippines. It makes any dish richer and savory; be it soups, stews, meat, fish and seafood dishes, vegetables, salads, and even desserts. Growing up in the province, I literally lived next to these tall palms (or trees, however you call them) as our house is in a property with plenty of bananas and coconuts. For today’s post, here is a seafood dish with coconut milk —my version of ginataang tilapia. It’s really easy guys. 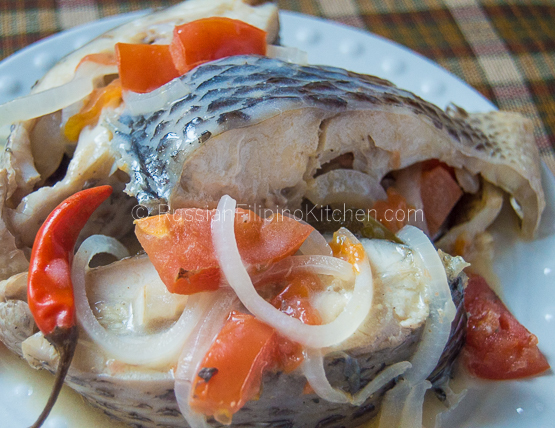 One of the many ways you can cook tilapia aside from the usual frying, paksiw, tinawsihan, and escabeche. This one’s light on the coconut milk and not too spicy. If you want a thicker sauce, double the amount of coconut milk and omit the water. Or you can use coconut cream instead plus add some water. If you want it spicier, use more chili peppers according to your taste. 1. Sprinkle tilapia with 1 teaspoon salt and set aside. 2. Peel onion and slice thinly. In the same way, peel ginger and slice thinly. Peel garlic and mince. 3. Wash tomato and slice into chunks. 4. Heat cooking pot on medium and add oil. Saute ginger for one minute until fragrant. 5. Add onions and garlic until onions are limp and garlic has browned a little. 6. Pour in coconut milk. 7. Add tomatoes, Thai chilis, and water. Season with ¼ teaspoon ground black pepper and stir. 8. Arrange tilapia slices into the pot. 9. Bring to a boil then lower heat and simmer for 15 minutes until sauce has reduced. 10. Remove from heat and serve.